Like many rabbis I’m often asked why I chose to become a rabbi. People are interested to know if there was a pivotal moment in my upbringing that steered me to the rabbinate. In responding to that question I’ve always cited my years as a student leader at Michigan State University Hillel. 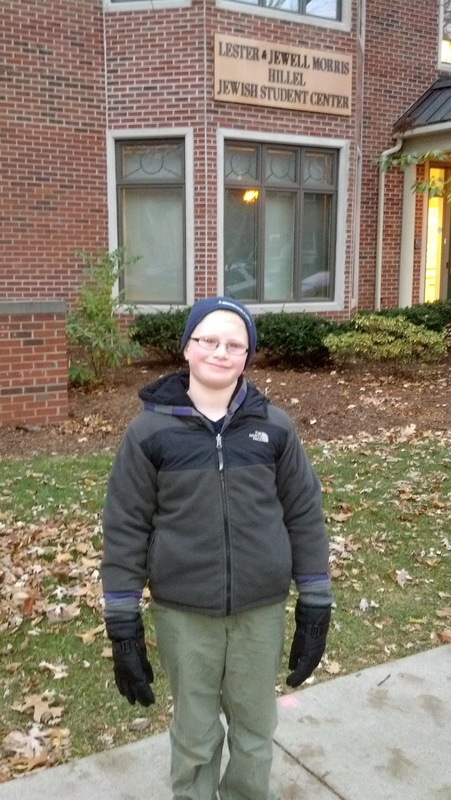 A few weekends ago I spent a memorable weekend in East Lansing my eldest child and attended Shabbat festivities at MSU Hillel. It was the first Shabbat I experienced on the MSU campus since my graduation from the university almost fifteen years ago. It proved to be a nostalgic weekend for me and one in which I truly gave thanks for the many gifts that MSU Hillel provided for me. 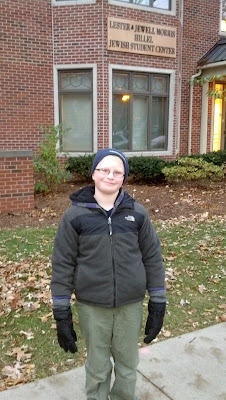 My son in front of the MSU Hillel building earlier this month. Early on in my college career there was a fire at the Hillel building. The structure was already old and in need of remodeling. After the fire, students attending events at Hillel would complain of the horrible smell from the fire and water damage. There was no doubt that a new Hillel building was sorely needed. I became a student leader at MSU Hillel almost immediately. During “Welcome Week” my freshman year I was asked by the president of Hillel if I would be interested in taking a vacant position on the Hillel board. I had served as president of my synagogue youth group as a high school senior and just returned from a summer in Israel on a teen tour so I was eager to get involved in Jewish life on campus. I replied that I was interested and the rest was history. I jumped right in and soon found myself spending a lot of time at Hillel. During my sophomore year I co-led the student board and was chairman of the Jewish Student Union. So after the fire I had a seat at the table discussing building plans with leaders of the institution’s “adult” board, architects, Jewish Federation leaders and donors. I recall a Federation executive cautioning me not to get excited about seeing the imagined new Hillel building while I was still a student, but that I would one day take pride in knowing I had something to do with its creation. That lesson from the Federation executive proved true. The invitation to attend Shabbat dinner a few weeks ago was to honor MSU Hillel on the tenth anniversary of its Lester & Jewell Morris Hillel Jewish Student Center. Leading Shabbat evening services on the second floor that night I looked out at the very young looking faces in the congregation and flashed back to the many times I led services as a college student. I looked into the beautiful library room where one student was busily studying and recalled the thousands of hours I spent sitting in the old library of Hillel cramming for final exams, exploring ancient Jewish texts, and writing my admission essays for rabbinical school. Following services that night my son asked why there were so many students at Shabbat dinner. I explained that Hillel was the only place on campus for students to enjoy a hot, kosher Shabbat meal. I told him how important Hillel is for Jewish students on campus. And then I told him how important Hillel was for me. Without MSU Hillel I don’t know where I would be today.